with that industry or have worked in the industry yourself. Learning and Development industry is no different and the list of acronyms are never ending especially when you are talking to Learning Management System (LMS) Vendors. AD- Active Directory: A Microsoft's trademarked directory service, which is used by organizations to maintain a list of all employees, usernames, passwords, etc. and can be integrated with multiple software systems including LMS. AI - Artificial Intelligence: A variety of techniques built in the LMS system that replicates the role of a human tutor/instructor, effectively guiding and coaching the learners through the content. AICC- Aviation Industry Computer-Based Training Committee: A standard that facilitates proper communication between the course content and the learning management system. API- Application Program Interface: A set of protocols or code that IT team uses to tie/integrate the LMS with other systems such as CRM, HRIS, HRMS, etc. APP- Application: Downloadable program on mobile devices for providing certain LMS features and is mostly used for offline learning, micro-learning. AVI - Audio Video Interleave: A multimedia container format introduced by Microsoft, which is not functional on most browsers, mobile devices, etc. CBT -Computer Based Training: An old term for self-paced eLearning, where primarily a computer is used to for delivering training, monitoring learners’ progress, and assessment. CE -Continuing Education: A term mainly used in US and Canada referring to post-secondary learning activities and programs. It is also known as adult education. CEU -Continuing Education Unit: Credit awarded to professionals for successfully completing continuing education programs or courses. CDN - Content Distribution Network: A technical solution that allows delivery of rich content to a LMS user from the local or closest server. It provides seamless and faster access of content to learners and it doesn’t matter how far they are from your origin server. CFR, CFR Part 11, 21 CFR Part 11- Code of Federal Regulations: US Federal Drug Administration regulations on electronic records, signatures, audit trails and password instructions for pharmaceutical, clinical/biomedical organizations’ software solutions including LMS. CMI-5 -Computer Managed Instruction: The future standard for Learning Management System communication, which is being developed for interoperability, extensibility, and mobile support and can replace existing standards such as AICC or Scorm. CMS -Content Management System: An online software that allows organizations to build, edit and publish, content and can be integrated with a LMS to share content or user data. CPD - Continuing Professional Development: Another word for Continuing Education (CE) where professionals are required to take courses on a regular basis to maintain license in certain industries. 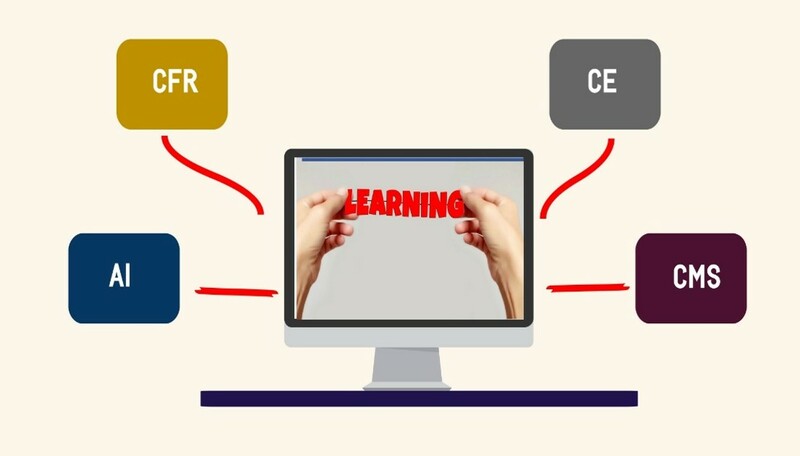 EEL- Extended Enterprise Learning: A LMS training system that targets non-employees such as external distribution partners/resellers, franchises, service technicians, and customers, etc. through the same platform.